Our Natural Series collection is like a bundle of fresh flowers, the fragrance of which mesmerizes one and all. We prepared this collection from the biotic combustible materials brought straight from the lap of the nature. Each of the stick is carefully molded to form Incense that soothes the mind, body, and soul. The fragrances of these Incense Stick will bring you closer to God as it will help you focus on God. 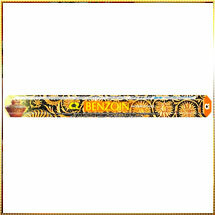 Our mesmerizing range of Benzoin Incense Stick is highly demanded in the market.